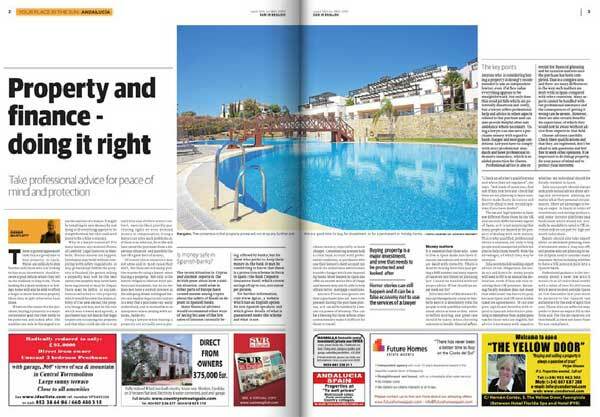 There is general agreement that this is a good time to buy property in Spain. Prices are unlikely to drop further and those who are looking to buy as an investment should receive a good return when they sell in the medium to long term. Those looking for a main residence or holiday home will also be able to afford a larger or more luxurious property than they might otherwise have done. Whatever the reason for the purchase, buying a property is a major investment and one that needs to be protected and looked after. The number one rule in this regard is to use the services of a lawyer. It might be tempting to save money by not doing so if everything appears to be straightforward, but this could well prove to be a false economy. Why is a lawyer essential? For many reasons, says Antonio Flores, of Lawbird Legal Services in Marbella. Horror stories can happen. This entry was posted in In the Media and tagged Antonio Flores, Lawbird Legal Services on April 18, 2013 by admin.